It was the one of our Thol trip. And as usual our daughter fall asleep before reached the destination. So Pankaj had to start birding without us. At first I stayed in the car and try to kill time by playing candy crush in my cell phone. After sometime I heard a distant shrill call which was stand out from other commoners plus its felt familiar. I came out of the car and start looking for some movement. Then I locate Indian Golden Oriole on nearby Pithecellobium dulce (ગોરસ અં।બલી) tree. 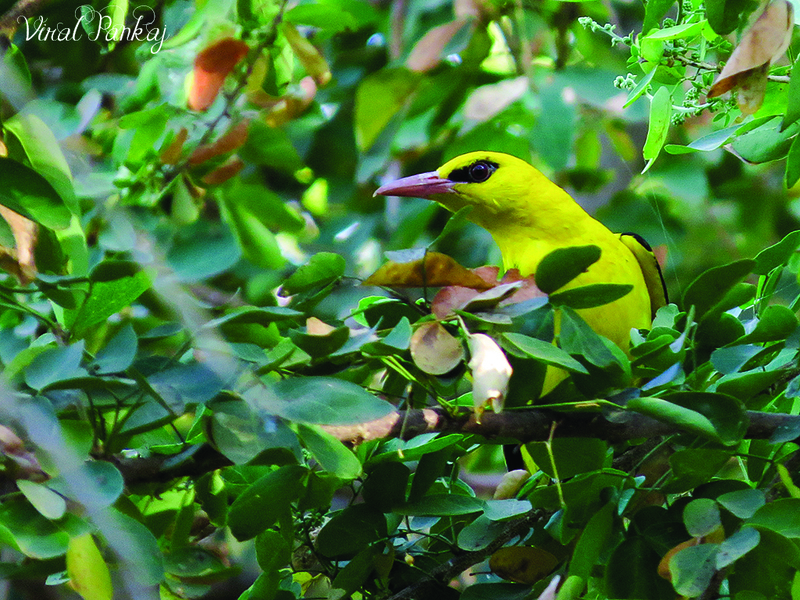 It was male Indian golden oriole, its beautiful golden colour contrasts with the largely black wings+tail and pink bill. Its looks impossible to overlook because of its striking colours. 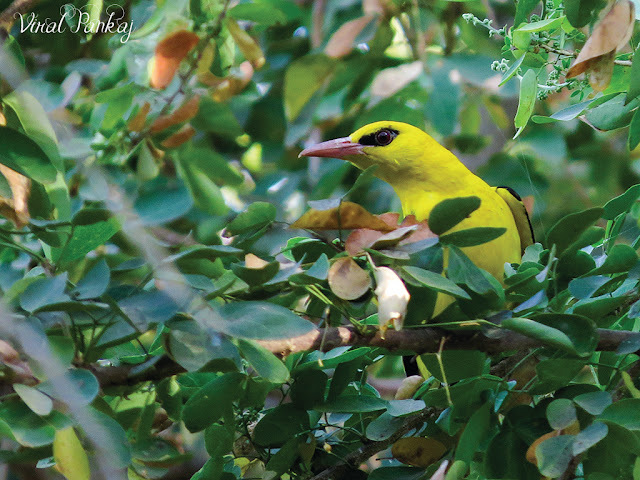 Despite its bright plumage, the Indian golden oriole is often surprisingly well-hidden amongst dense greenery, but its distinctive whistling call always reveals its location. It was jumping from one branch to other busy in feeding, apparently unaware by my presence. I can even able to take clear shot with our Canon SX-50 HS. It was still foraging on same tree when my daughter wakes up. She was also happily take some shots. Then came some van drivers out of the curiosity and asked what are we doing? That noise is more than enough to alert Oriole so its fly away.